This year’s Alternative Federal Budget (AFB) has just been released. I was proud to be part of this year’s effort, coordinated by staff of the National Office of the Canadian Centre for Policy Alternatives (CCPA). Create 470,000 new (full-time equivalent) jobs. This would be good both for the individuals who get these jobs and for the bottom line of federal, provincial and territorial governments (as it would increase tax revenue and reduce the need for some forms of income assistance). Overall, more than 600,000 jobs will be created or maintained in the second year under the AFB plan. Increase program spending, over and above what the Trudeau government has already promised. Specifically, the AFB proposes to increase program spending, as a percent of GDP, from 14.2% (which was the case for 2017/18) to 17.2% in 2018/19. The AFB also proposes to allow Canada’s federal debt-to-GDP ratio to move from 30.5% (in 2017/18) to 31.1% in 2018/19. Introduce a national pharmacare program. This proposal would help address the fact that many Canadians simply cannot access prescription medication; it would also result in reduced premiums paid by employers for health benefits for their employees. This initiative would cost the federal government $11.5 billion annually, but would likely save Canadian households and employers almost as much (previous analysis of such potential savings can be found here and here). Address involuntary part-time employment among women. Points raised in the gender equality chapter include the following: women perform considerably more unpaid work in the home than men; increasingly, many women who work part-time in Canada report doing so involuntarily; and among women working part-time involuntarily, half say a lack of available child care is the reason they’re not working full time. To help address these challenges, the chapter proposes both universal child care and paid paternity leave (there are indications that paid paternity leave is already being contemplated by the Trudeau government). Reduce poverty. The AFB proposes earmarking $4.4 billion annually as a Goods and Services Tax credit top up for low-income Canadians. It further proposes that $4 billion annually be transferred to the provinces and territories for their poverty-reduction initiatives (for such measures as social assistance). Finally, it proposes that $3.5 billion in new funding be spent on affordable housing, noting that the federal government’s recently-unveiled National Housing Strategy represents a rather modest increase in new builds going forward (full disclosure: I was primary author of the AFB’s housing chapter). Reduce seniors’ poverty. Specifically, the AFB would expand the Canada Pension Plan (CPP) replacement rate from 33% to 50% (for a general overview of CPP, check out this blog post). It would also increase the Guaranteed Income Supplement (GIS) top-up by $1,000 annually for seniors (for a general overview of federal income support for low-income seniors, see this blog post). Further, the AFB would increase annual federal funding for long-term care by $2.3 billion. In light of the fact that the percentage of seniors in Canada living in poverty (as defined by the low income measure) has been rising since the mid-1990s, these measures are quite important (check out Charts 1 and 2 on page 5 of this report). Eliminate tuition fees for all post-secondary students in Canada. 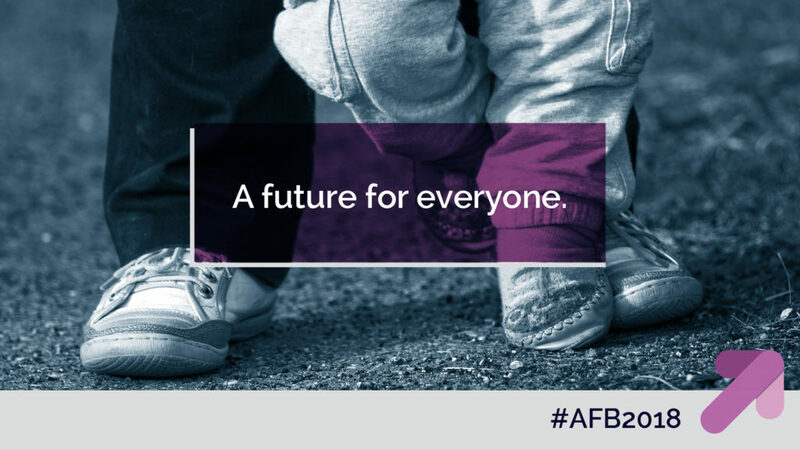 The AFB would also eliminate several tax expenditure measures (namely, the federal tuition tax credit and the RESP tax credit) that are currently costing the federal government a considerable amount of money while disproportionately benefiting higher-income Canadians. Speed up the implementation of the federal government’s planned carbon tax. By July of this year, there will be a federal carbon tax of $10 per tonne; this will then rise by $10 per tonne more each year until it reaches $50 per tonne in 2022. The AFB would make it $30 per tonne this July, raising it by an additional $10 per tonne until it reaches $50 in 2020. Revenue from this tax would be used for several initiatives, including annual rebate cheques to all Canadians ($300 per adult when the carbon tax is $30 per tonne; $400 per adult when it’s $40 per tonne; and $500 per tonne when it’s $50 per tonne). Redistribute income. 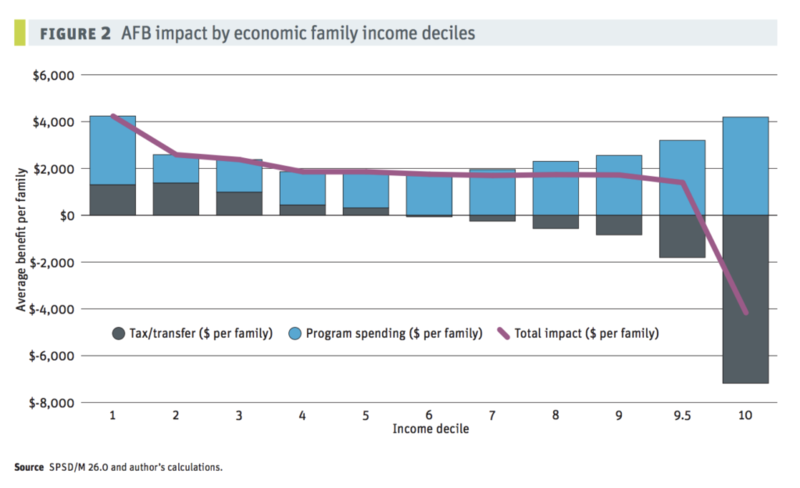 As can be seen in the visual below, the biggest ‘winners’ in the AFB would be the poorest 10% of income-earning families—they’d see an increase in annual income of approximately $4,000 (a figure that includes both tax changes and program spending). In Sum. The AFB has been produced for more than 20 years (for more on the history of the project, see this blog post). Staff at the CCPA estimate that 30% of the previous year’s AFB found its way into the Trudeau Liberal platform during the 2015 federal election. Here’s hoping the AFB remains influential in the actual budget-making process going forward! The author wishes to thank Seth Klein for feedback on a draft version of this blog post. Any errors lie with the author.